Before readers outside the USA start asking, this album just came out here in the States, and not on the band's worldwide home, Roadrunner. It's anyone's guess why — maybe someone decided the Alaskan quartet's bearded-and-burly look wasn't gonna sell to the Hot Topic kids, or that their screamo-tinged metal was just a little too 2002 to hit any target markets. 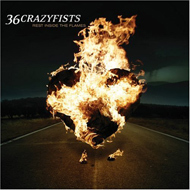 But then again, as closely as they brush up against flavors of the week, 36 CRAZYFISTS have always seemed a little left-of-center of the prevailing trends. A little too melodic for the metalcore crowd, a little too heavy and quirky for the emo kids, the band is seemingly designed to fall through the cracks. What can't be denied is that they put over heartfelt, genuine songs with honest-to-god hooks in them, their collective heart on their collective sleeve, and a big, warm, inviting sound. Singer Brock Lindow may come across like that warbly guy from OUR LADY PEACE in his more vulnerable moments, but he can shriek with the best of 'em, too. His confident melodies mesh well with the big, slashing chords and stuttering start-stop of the guitars to make for a larger-than-life, charismatic sound. Generally, the more singing Lindow is doing, and the more slashing, downpicking melodies the guitars are urgently churning out, the better the songs – see the impeccable "We Cannot Deny" or the rhythmically dense "Between the Anchor and the Air" for examples of great songs where the band has really managed to knock it out of the park. At the end of the day, though, there's an indefinable "something" that seems missing on "Rest Inside the Flames". Some of the songs are full of jagged rhythms and juxtaposed melodies but lack any real cohesion. Others seem pat and formulaic, giving off the air of tired or uninspired songwriting, technically proficient but lacking in the personality that this band should be giving off in waves. "Rest Inside the Flames" is a good, solid record, but it's hard to escape a feeling of coasting — and this isn't the time for 36 CRAZYFISTS to be coasting. They possess all the ingredients needed to rise above the pack, which makes it frustrating that this album seems so determined at times to bury itself amid its peers. Hopefully they'll get another shot at greatness before the industry casts them aside in favor of next year's model.